A rare gem; entertaining AND thematically compelling. No doubt about it, the Gilroy brothers can write. Tony gave us Michael Clayton, and now brother Dan hands over Nightcrawler. 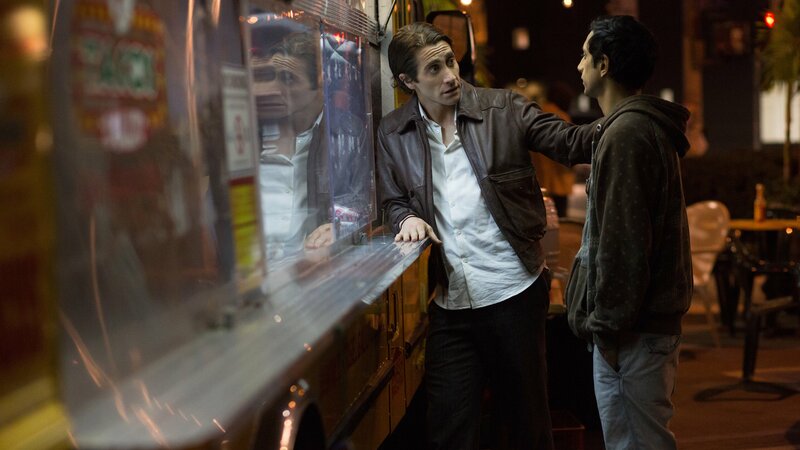 Brilliantly simple and purposeful in its execution, and every bit as well constructed as the former, Nightcrawler earns its Academy Award nomination. The Dramatica theory of story makes a distinction between Main Characters who Adopt their Influence Character’s position on things and those who Maintain their original paradigm (known as the Main Character Resolve: Change or Steadfast). If there ever was a poster boy for those characters who maintain their original position, it would be Lou (sorry, Louis) Bloom (a masterful Jake Gyllenhaal). Driven to draw conclusions based on what he has read and learned (Main Character Drive: Deduction), Lou pursues success with a certainty (Main Character Crucial Element: Certainty) and an optimism (Main Character Growth: Start) that never wavers, never wanes. Saddled with a bleak economic landscape that tells him what he can and cannot do (Main Character Issue: Work), Lou works his way up the video broadcast ladder (Main Character Problem-Solving Style: Linear) , challenging the status quo of what is permissible on network television (Overall Story Issue: Permission). Bloom steals, trespasses, alters crime scenes, and withholds information on his journey to win friends and influence people (Story Driver: Action, Overall Story Throughline: Manipulation). No one looks at Lou and sees what he is capable of (Main Character Symptom: Potentiality). Those who do—the security guard near the train tracks and rival video vulture Loder (Bill Paxton)—meet a most unexpected and violent end (Main Character Approach: Do-er). Bloom doesn’t hire an assistant—he hires a protegé (Relationship Story Concern: Learning). Rick Carey (Riz Ahmed), a homeless kid fixated on making only enough money to get through the night (Relationship Story Throughline: Fixed Attitude), takes Bloom’s first offer without counter and without hesitation (Influence Character Problem: Acceptance, Influence Character Critical Flaw: Expediency). The conflict at the heart of their relationship? Bloom’s unspoken confidence in Rick’s tendency to be a sap (Relationship Story Problem: Probability). After hours and hours of counseling from Bloom concerning his lack of drive (Relationship Story Symptom: Potentiality), Rick finally stands up to his boss and in the moment of crisis, refuses to accept Bloom’s low-ball wage (Influence Character Solution: Non-Acceptance). Complete stories demand Influence Characters to Adopt the Main Character’s Paradigm when the Main Character Maintains theirs. Rick blackmails Lou the same way Lou blackmailed Romina (Rene Russo), securing Nightcrawler’s position in the pantheon of successful narratives. Unfortunately for Rick, taking such an approach signals the possibility of more trouble—giving Bloom cause to end their relationship (Relationship Story Solution: Possibility). Lou’s measure of success? A newsroom full of professional anchors and crew catching on to the importance of Lou Bloom himself (Overall Story Goal: Conceiving an Idea, Story Outcome: Success). Follow that up with an army of interns eagerly anticipating his every word and Lou confindently heads out into the night knowing he has finally made something of himself (Main Character Throughline: Situation, Story Judgment: Good).